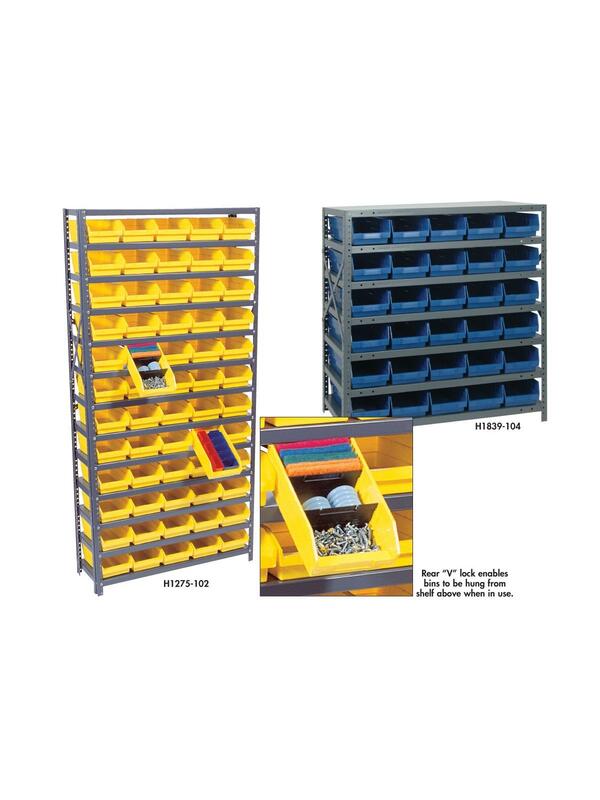 Economical bin storage system includes durable Plastic Shelf Bins and a 36"W standard shelving. Identify parts easily. Rugged 350 lb. 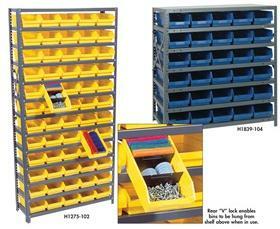 capacity per shelf, standard shelving unit will keep parts organized and readily accessible. Gray enamel finish will not rust or corrode. 12-HQSB100, 8-HQSB101, 5-HQSB102, 4-HQSB107, 3-HQSB109 fit across a standard 36"W x 12"D shelf. 8-HQSB103, 5-HQSB104, 4-HQSB108, 3-HQSB110 fit across a 36"W x 18"D shelf. Bins are available in Blue, Yellow, Red, Green, Ivory or Black. D x W x H Qty.